WHEN: Tuesday, April 7, 2015, 5:30 p.m-7 p.m.
HOW: Event entry is FREE. 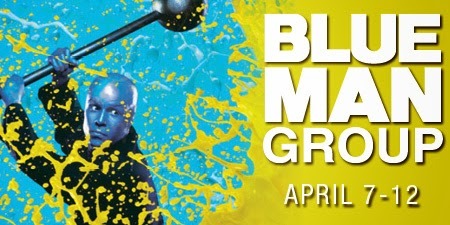 Limited half price tickets* available for the 7:30 p.m.performance on April 7 can be purchased entering the promotional code KIDSNIGHT atfoxtheatre.org/blueman, calling 1-855-285-8499 or visiting the Fox Theatre Box Office (660 Peachtree St NE, Atlanta, GA 30308). *Valid on dress circle tickets, while supplies last. Blue Man Group plays April 7-12 as part of the Fifth Third Bank Broadway in Atlanta 2014/2015 season. Tickets are available at by visiting foxtheatre.org/blueman, calling 1-855-285-8499 or visiting the Fox Theatre Box Office (660 Peachtree St NE, Atlanta, GA 30308). For more information, please visit www.broadwayinatlanta.com.